Ransomware has become a major concern for organizations around the globe. The U.S. Department of Justice reports that an average of 4,000 ransomware attacks occur daily. These ransomware attacks aren’t just targeting laptops and other end-user devices either. Servers are equally at risk of ransomware attacks as well. 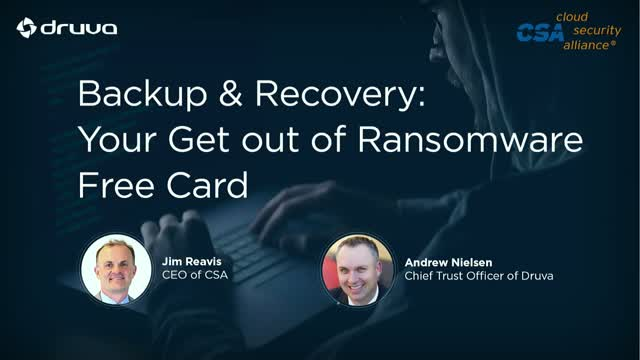 There’s good news though - your backup data can be difference between being held hostage and easily recovering from an attack. All registrants will receive a free copy of Druva’s Annual Ransomware Report: 2017 Survey. Andrew (aka Drew) has more than 15 years of experience in information security, primarily focused on security architecture and product definition. At Druva, Drew is responsible for defining the security and compliance direction of products and services, and his background in both the private and public sectors gives him unique perspective on current and emerging security trends. Prior to Druva, Drew held various security architecture and product roles at FireEye, Hitachi Data Systems, Silicon Valley Bank, and Raytheon.